Our installations are located in St-Ours, Quebec a little town of 1609 poeples at 80km east from Montréal. 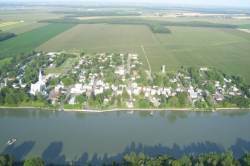 Until 1992 our town was THE smallest town in Canada. We see at left an aerian view of our town. Longitude : W 72° 53' 28"
Latitude : N 45° 52' 20"